Counsellor Laura Krahn works the evening shift at the Toronto office of Kids Help Phone, on Jan. 27, 2019. Ms. Krahn is one of 14 counsellors covering a weekday evening at the Toronto headquarters. Another six are staffing the Montreal location. By the time the morning team arrives at 7 a.m, the night shift will field 750 calls and live chats from young people across the country. Trained volunteers, supervised by paid counsellors, will handle 466 text conversations. Weekends are even busier. Kids Help Phone, which was launched by a group of Toronto-area business people as a distress line for victims of child abuse, and quickly expanded its mandate, will mark its 30th anniversary in May. The helpline will mark this milestone as Canadian studies show an increase in young people reporting anxiety, depression and stress that keeps them up at night, with their options for timely help limited by mental-health services stretched thin. Last year, Kids Help Phone counsellors handled more than 103,000 phone calls and 175,000 live chats, numbers that held steady even when a national texting service launched in November. Even so, in a 2017 survey of Ontario students, one-third said that they wanted to talk to someone about a mental-health problem in the past year but didn’t know where to turn. Teenagers call about break-ups, fights with friends, failing grades and parents who just don’t understand – that hasn’t changed. Counsellors never know who is on the other end until they pick up – a “tester” still working up the nerve, an LGBTQ teen who wants to rehearse coming out to their family, someone disclosing a sexual assault for the first time. Some conversations last a few minutes, others more than an hour. Parents and teachers worried about a young person also call in or text for advice. To cover questions, counsellors have access to a database of referrals to 30,000 sources of help in almost every corner of the country. The helpline also gets a share of callers asking how Smarties are made – its number often appears on candy bars. But even those prank calls, with some gentle prompting, can lead to somewhere serious. Ask any counsellor at Kids Help Phone about the calls they can’t forget, and the stories are gut-wrenching. The 10-year-old girl calling from a remote community, waiting for her abuser to return home, who goes to hide in a closet. The boy, on a payphone and out of quarters, who runs from his house without boots or a coat because he has tried – and failed – to stop his stepdad from beating his mom. The tearful callers who hang up with a whisper, mid-confession, “Gotta go, someone’s coming.” The text that never gets answered. You have to live with not knowing and move on, the counsellors say. There’s always someone else waiting. For Stephen Hooper, who used to sneak over to his grandparents' house to call the helpline, it was nonetheless a life-changing experience. When he was 13, growing up in Chance Cove, N.L., he had questions about his sexual identity – but no one to ask. He worried about how his friend would react and he had heard people calling homosexuality an illness. 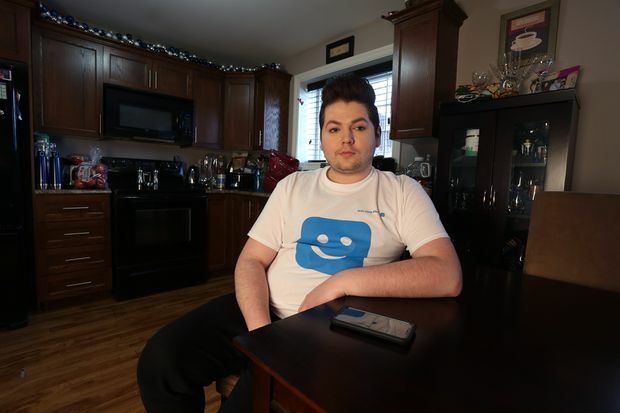 But “there was one person on the phone saying, 'There is nothing wrong with you,” the 26-year-old recalled, speaking from St. John’s, where the former model now works as a social-media influencer and encourages his followers to use the helpline. “They made me feel comfortable in my own skin.” He credits those calls with helping him come out to his best friend, who was unfazed. “Thank God,” she said, “now we can talk about boys.” Later, he also came out to his parents, who were supportive. Stephen Hooper at home in St. John’s, N.L. While the subject matter may be much the same, the calls have become more intense. Between 2013 and 2018, the proportion of calls related to suicide almost doubled, to 15 per cent. More teenagers talk about feeling isolated. Bullying victims, who could once seek refuge at home, are now chased from school hallways onto Instagram. The conversations feel “heavier,” especially in texts, where young people appear more open to sharing. The texting program was piloted last winter and went national only three months ago, but from February to this month, 25,000 young people texted at least once. An algorithm colour-codes the texts according to risk and moves them up in the queue, with words such as “Tylenol” or “rope” raising particular alarms. Last year, the system deemed almost 6,000 conversations to be high-risk. For calls and live chats, counsellors can send emergency staff only if a caller gives their address – which is what happened with the boy on the payphone, who wanted police to check on his mom. With texting, they can be located through their smartphones. To date, as a result of high-risk calls, the staff at Kids Help Phone have initiated 761 “active rescues,” which means they directed police or paramedics to a texter’s location because they were considered to be in immediate danger. “No, I just can’t sleep. My head is spinning. … I feel like my life is all ‘thumbs down,’ and I’m so tired of feeling this way." In the Toronto office, with night passing, the mood is hushed across the labyrinth of cubicles, belying the urgency spilling through phone lines and from keyboards from parts unknown across the country. Counsellors type or murmur into headsets, occasionally gathering with a manager to talk through a tough conversation. One involves a 14-year-old girl who has been sexually assaulted and is on the phone with her mom. The counsellor provides information about how to file a police report, then stays on the line to help with the call. Since they can’t predict how long any single conversation will take, counsellors are encouraged to take short breaks when they can. In interviews, managers stressed the need for staff to tend to their own mental health. There’s an almost completed puzzle of the Louvre against one wall for counsellors who need to decompress. One, on a break, is circling the office, an open book in his hand. But breaks are hard to take when the queue is long, as it is tonight. On the far wall, an LED display, like a scoreboard in a high-school gym, shows in red numbers how many callers are waiting and for how long. Counsellors try to get to them as quickly as they can, but they might hold for as long as 90 minutes. Because they can be more easily triaged, the high-risk texts can be answered in less than two minutes. Ms. Krahn stares at her screen, working to keep the tone of her replies conversational while figuring out how to help. She’s 35, sporting shiny Dr. Martens, with a pixie haircut the colour of Bordeaux and a sunny, soothing energy even at the end of a long shift, recalling her list of calls and how she handled them. The staff at Kids Help Phone are strict about anonymity, so a third party was not permitted to listen in or read chats in real time. Ms. Krahn has been working here for eight months, while finishing her third master’s degree. There are a few “lifers” among the counselling team, but several are more recent hires, suggesting a job that takes a toll. Callers will often ask, “What should I do?” But counsellors are trained to help guide them to their own solutions rather than lead with advice. Besides, Ms. Krahn says, it’s a bad adult habit to minimize teenage worries or “jump to diagnosis." That mistake, she says, makes kids go silent. “It is really about taking the time to listen from a place of genuine curiosity, not assumption.” She worries, too, that teenagers “seem to be living through this idea that it’s not okay to feel sad or angry or disappointed.” So she tells the grieving teenager that it’s normal to feel the loss of her grandmother – maybe you can ask your mom to tell you some stories, she suggests. Sharing a laugh always helps. When she and her second caller giggle over a song lyric Ms. Krahn has googled, that’s a clear sign they’ve made progress. After two hours, the live chat ends. Ms. Krahn has asked the caller to think about a “thumbs up” day, to consider what they might need to feel better understood by their friends and family. She has tried, indirectly, to work out a safety plan – what the teenager might do to work through their negative feelings the next time they feel overwhelmed, a strategy many experts suggest for suicide prevention. Part of that includes calling back if they need to. The teenager says they feel better and they’re going to bed. “I often feel like I have been on a journey,” Ms. Krahn says, ready to head home. She likes to ride her bike to clear her head, or write in her journal, reflecting on what she handled well, where she might have done better and to maintain perspective. Some conversations, though, are hard to let go. “If I am still carrying a call with me, I might send them a little wish.” To be happy. To be safe. And to find someone to listen to them.